The book has several methods. And I talk about other affiliate programs, not only Amazon. Amazon has very low commissions and yes, due to this book being so popular, the competition in some niches is fierce. While in other there are none. Just like you suggested the small twist that W White did with this exact method. He found an offer that no one banks on and made a lot of money in a single day with the same techniques I talk about in my guide. I also tested affiliate programs but I get only clicking. Your book is no longer in effect. I think that you should add any update or finish the sale book. 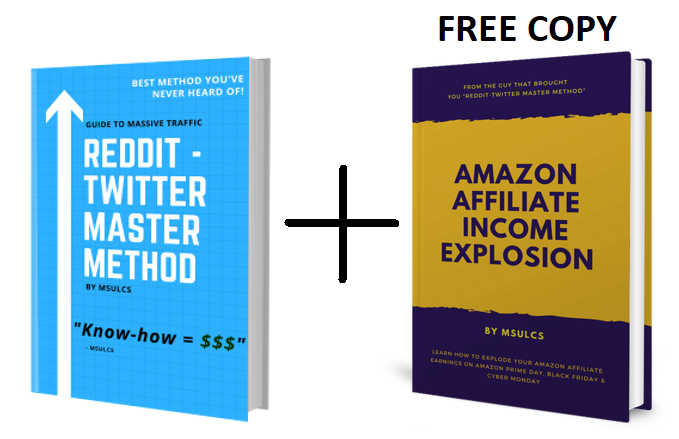 Get a $27 discount + Free Copy of my second Reddit guide - Amazon Affiliate Income Explosion (regular price $35). Special Deal Combo Price = $40 (cheapest there ever was, save $62!). Reply in this thread with words "SHOW ME THE MONEY" for a discount code!